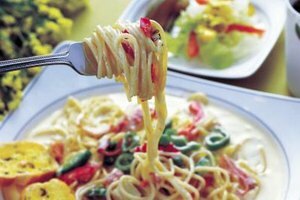 Top pasta with fish and other fresh ingredients. Although fish and pasta may sound like an unlikely recipe duo, the delicious combination may have your family members and dinner guests asking for seconds. Combine the fish with other fresh seafood to create flavorful dishes that will work for everything from casual weeknight meals to elegant dinner party fare. Angel hair pasta topped with fresh or frozen-thawed cod makes a light and satisfying meal. Saute the cod in a skillet and create a tasty sauce using butter, parsley, stewed tomatoes, freshly squeezed lemon juice and dry white wine. Spoon the sauce over hot pasta and serve the fish on top or to the side. The secret to delicious tuna spaghetti is using high-quality, olive oil-packed fish. The dish is a creative alternative to traditional spaghetti and sausage or meatballs. To prepare the sauce, add the tuna to a skillet of homemade or bottled marinara sauce. Mix in briny capers or sliced olives, a dash of freshly squeezed lemon juice to add brightness and Italian seasonings to taste. Serve the hearty sauce over hot spaghetti. If you're searching for a lasagna recipe with a twist, you can't go wrong with creamy seafood lasagna. Create a rich seafood sauce using condensed cream of mushroom soup, white wine and a variety of seafood, such as flounder, scallops and shrimp. Layer the sauce in a baking dish with cooked lasagna noodles, ricotta cheese and shredded mozzarella. Bake the lasagna until it is bubbly and golden brown on top. Smoked salmon and a rich cream sauce make for a decadent pasta dish worthy of special occasions. Make the sauce by combining heavy cream, butter, a bit of tomato sauce, and sauteed garlic and onions. Add flaked smoked salmon and serve over farfalle, or bow tie, pasta. Balance the richness of the dish with a refreshing mixed greens salad with light ranch dressing.